Among many happy memories from my childhood is a rather annoying recollection. Every day, as a whole bunch of children including my friends and I, would be returning home happily exhausted after hours of play, our parents would meet us at the doorstep and remind us that enough fun had been had, it was now time to study. It was as if there existed two mutually exclusive domains of activities with play having unfavourable repercussions for learning. It also seemed that learning was the more important activity, while play was allowed to humour us children, sometimes at the condition of first ‘finishing’ learning. Even now, it is not uncommon to listen to concerned parents talk about how their child seems to only ‘play’ at school and ‘learn’ nothing at all. In this article, it will be my attempt to reach out to teachers and parents of children in the developing years and highlight the importance of play in development. As Maria Montessori said many years ago, “Play is the work of the child.” Today, it is almost universally accepted that children develop and learn principally through play. Another way of looking at this quote is that for children, play is as serious an undertaking as work is for adults. Play has a formative role in the development of many capacities and skill areas in children. 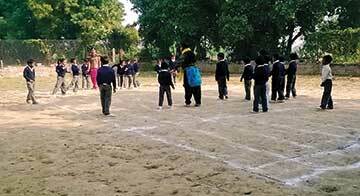 Also, it has immense potential as an entry point or inroad into the learning of children. We will begin by looking at what play is, how it influences the development of various capacities within the child, and finally, briefly examine what adults such as teachers and parents can do to support and enhance the value of children’s play. Despite the interest shown by psychologists to understand its nature, play has proved to be a remarkably elusive and complex phenomenon to define. The primary reason for this is that play, by its very nature, is multifaceted and often spontaneous. Two situations that are entirely dissimilar may both be called play. Take, for instance, a child who finds a tin can while walking back home from school and ‘plays’ with it by kicking it all the way home. Another is a group of 6 year olds ‘playing’ ‘teacher-teacher’. Many more examples can be cited, each of which brings out a different aspect of children’s play. Developmental psychologists have tried to classify play on various bases like the degree of social participation involved, location of play, whether the play involves actual objects or is symbolic in nature, whether it involves vigorous activity or quiet engagement, the degree to which the play situation has been structured for the child, and so on. Underlying all these kinds of play are some common features that are agreed upon by many, if not most, researches, as being definitive of play. These characteristics are that play is fun, play is enjoyable for its own sake and that play is that activity in which participation is spontaneous and of the child’s own will. These characteristics help us understand why sometimes activities that require no materials, that are entirely unplanned, such as jumping over every alternate stone till you get somewhere, are play. They also help us understand why we never need to reward children to keep playing and why the same activity, when done under direction, may no longer remain fun and no longer remain play. Given the overwhelming presence of playing behaviour, many commentators have tried to examine play from an evolutionary perspective. The fact is that for any aspect of development that you consider, there is a form of play that is possible and engaged in by children. At the first available opportunity, children construct, destruct, manipulate, imagine, innovate, represent, and communicate, regardless of whether it is actual objects or ideas or images or words we are talking about. Think of the numerous times you have seen a child dismantle a newly acquired toy or repeat a word, pronouncing it differently each time, giggling over how funny it sounds. Psychologists believe that this typical behaviour of human beings tells us that being playful has had an adaptive advantage for humans, and has helped us to become a successful species. Specifically, developmental psychologists across the world have extensively studied and theorized the psychological processes involved in play and the precise nature of learning or development supported by it. In the next section, we will look more closely at how play impacts the major areas of development in the growing up child. Both physical and motor development depend upon the maturation of parts of the body as well as the opportunities available to the child to practice skills in these areas. Many large and small muscles get exercised during play and develop as a result of the stimulation. Outdoor and vigorous play has obvious health benefits and leads to better metabolism and physical development. Whether it is reaching age-appropriate height milestones or maintaining ideal body weight, play contributes positively. Further, play provides the child with opportunities to develop skill areas. Skill areas such as gross motor skills, fine motor skills and psychomotor skills are learned, practiced, and refined with play activities that support the development of these areas. For instance, when children balance on rocks, hang from trees, jump over fences, climb steps, play games of running and chasing, ride bicycles, the coordination of large muscles improves. Similarly, playing with a stick, digging holes in the ground with it, making a necklace by threading leaves, drawing and painting gives the child practice for fine motor coordination. Many of children’s play activities such as throwing and catching a ball, skating, dancing, and playing musical instruments allows the coordination between cognitive and physical functions to develop known as psychomotor development. In the earliest phase of life, the baby plays with and explores her own body and things in the immediate environment. Known as circular reactions, the infant tries to repeat chance occurrences. Through repetition of sensorimotor activities such as grasping and kicking, the infant slowly understands that her body is separate from other objects in the environment and this leads to the development of the concept of self. Soon, the infant begins to understand through play activities the effect she has on the people in her environment. You can try returning a ball a 6-month-old infant has kicked off the bed by ‘accident’, only to find that no time will be lost in gleefully kicking it again! In fact, the very first social interactions have their roots in the playful exchanges between the mother and the child. Mildren Parten in her research identified a developmental sequence of play — as children grew, their social participation increased and they moved from solitary to more cooperative forms of play. Also, as children start participating in play with others many situations that require a diverse range of social skills are called on. Research across the world suggests that social competence, which is a cluster of social skills such as sharing, cooperation, negotiation, and the ability to display and control one’s behaviour and emotions, develops as a result of play with others. Similarly, social perspective-taking skills, which involve looking at a situation from the perspective of not just the self but also of the others is developed during play. Advanced pretend play, known as socio-dramatic play, encourages children to enact and acquire rules of social life and practice self-restraint and impulse control. In order to act as ‘cops’ and ‘robbers’, all children will have to agree upon who will play the cops, who will be the robbers. Both cops and robbers will have to understand their respective roles, understand the larger narrative of cops being good and robbers being bad, and exercise impulse control while in their roles. Developmental theorists are of the opinion that play teaches children to transcend egocentric or self-centric behaviour. It is not surprising therefore to find that many prosocial behaviours, such as empathy, sensitivity, sharing, turn taking, and cooperation are learnt by children during play. Children’s play provides them opportunities to express delight, joy, anger, fear, distress, and other emotions. When children play they usually do so with abandon letting out not just surplus energy, as was previously understood, but also emotions. It is in the context of play that children learn display rules for various emotions. For instance, while it is alright to dance in joy on hitting a six in the game of cricket, it may be frowned upon, or worse, if you go dancing in front of a batsman who just got run out! Both winning and losing during play are emotional events and require regulating of one’s emotions. Playing teaches children sportsmanship. An entire field of psychology is devoted to the use of play as a therapeutic tool. The underlying idea of play therapy is that during play children often express themselves in ways in which they may not otherwise be able to or choose to. Many pent up emotions may be expressed by children during play activities and their play may be reflective of their own inner states. It is for this reason that play therapists try to understand what the child is trying to express through play. For instance, an emotionally disturbed child may express hostility, anger, and even helplessness through his/her play constructions. Many researchers believe that the imaginative invention in children’s play represents their effort to cope with the problems of daily life. Pretending to be the tutor, the child can ask another child to obey her, which she may not be able to do in other situations and which may be a reflection of her own problems. In this way, play helps children to express, regulate, as well as cope with their emotions, thus helping in their emotional development. In simple terms, cognition refers to higher order thinking skills such as memory, planning, problem solving, judgement, decision-making, imagination, and creativity. The interplay between play and cognition, that is, how playing impacts higher order thinking skills in children and how play is impacted by changes in the child’s cognitive level has been of interest to developmental theorists for decades. Many theorists of prominence have explained in depth how the play of children changes with changes in their cognitive capabilities. At the same time, they have also thrown light on how play acts as a catalyst for cognitive change and development. Jerome Bruner, in his classic paper entitled ‘Nature and Uses of Immaturity’ (Bruner, 1972) cited some very interesting evolutionary evidence stating that, as mammals evolved into primates and primates evolved into humans, not only was there an increase in the brain size, but also an increase in the length of biological immaturity, that is, the length of time a young one is cared for by parents as well as increase in playfulness. So, with evolution and increased cognitive capabilities, our capacity to play increased. While mammals were capable of rough and tumble play, primates could also engage in play with objects, and humans could also undertake ‘symbolic play’, such as make-believe play (Whitebread, 2012, p.64). Bruner argued that children’s play allows them to develop ‘flexibility of thought’, trying out different ways of thinking and solving problems. This adaptability and problem solving ability that emerge out of playfulness have made humans a successful species as per Bruner. Jean Piaget, whose theory of cognitive development is considered to be the cornerstone of developmental psychology, also talked about the role of play in both reflecting as well as enhancing the cognitive capabilities of children. According to him, the play of children reflects the cognitive problems they are currently engaged in. It is for this reason that a 2-7-year-old ‘preoperational’ child, whose thought is illogical and full of magical thinking engages in make-believe play. Playing ‘sword fight’ with a stick lying on the ground, or ‘house’, or having a pretend birthday party for a doll are all examples of such ‘make-believe’ play. As the child’s capacity to represent the world mentally in the form of ideas and images increases, make-believe play transforms into pretend play with lesser fantasy characters, more real life characters, and more complex story lines. Thus, play provides a background against which new ideas are tested, new mental structures are created and greater cognitive capabilities are developed. Lev Vygotsky, a Russian developmental psychologist, also gave play a place of prominence in his sociocultural theory of learning. According to Vygotsky, play contributes to the effortful, intentional learning, problem solving, and creativity required of children in educational contexts. He specifically relates playing to children developing a sense of self regulation and taking control of their own learning. He uses his concept of ‘Zone of Proximal Development’ to suggest that during play with peers, children set their own level of challenge and may be capable of behaving beyond their actual development. This indicates that play acts as a catalyst for achieving higher levels of development. The behaviouristic perspective on language development, which focuses primarily on the role of the surrounding language environment in the development of language, says that the richer the environment, the better is the development. Play provides children with an opportunity to both acquire as well as practice language skills. When children have not begun to talk, parents take the baby’s attention to the objects in the environment and label them. This playful exchange lays the foundation for the earliest attempts to talk. Later, when children start playing with others, it is common to find them acquiring vocabulary from their play mates. Whether good words or bad, children quickly absorb their peers’ language! Very often, play becomes a platform for children to practice imitated behaviours learnt from their parents, teachers, celebrities, and so on. Similarly, behaviours and language learnt from peers during play may be practiced at home. This imitation is explained by theorists as a kind of social learning that occurs when children observe and attend to certain words being spoken by a model, feel motivated to use them, and then go on to repeat the behaviour. Additionally, play provides children an opportunity to develop pragmatic aspects of language. The expressive aspect of communication, such as taking turns while talking, the use of subtle suggestion, sarcasm, or even the gradual change of a topic of conversation, known as ‘turn about’, may be learnt and practiced by children at play. As discussed earlier, it is play that allows young children to enter into social exchanges with age mates that require them to look at a situation not just from their perspective but also from that of the others. During their endless squabbles during play, children learn what behaviours of theirs are acceptable and unacceptable to others. They also learn to define their own tolerance of other’s transgressions. Lawrence Kohlberg, one of the most noted theorists of moral development, also suggests that children move from ‘Preconventional’ to ‘Conventional’ morality when they are able to start transcending their self-interests in order to establish good interpersonal relationships with those around them. A child who forsakes her turn at being captain to let her best friend become the captain or a child who resists the urge to cheat while his chess partner is attending a phone call is moving to a higher level of morality. You would agree that it is not uncommon to find children behave in these ways during play. Jean Piaget explained yet another important connection between playing and children’s morality. He theorized that as children become more cognitively mature, they move from the stage of ‘heteronomous’ morality to ‘autonomous’ morality. Put simply, this means that children move from a position of thinking that rules are unchangeable and rigid and that breaking them will inevitably lead to punishment to a position where they understand that rules have been made for facilitating the game and can be changed if the group decides so upon consensus. One again, it is in the context of play that children revize their understanding of rules of a group — why they exist and how they can be changed. Considering the multifarious ways in which play impacts various areas of development in children, it is certain that the role of play in the life of children is not secondary to learning. In fact, much, if not all, of children’s learning can be located in as well as strengthened in play. Keeping that essential point in mind, let us now briefly consider how adults such as parents and teachers can support children’s play. Researchers such as Pellergini (2009) are of the opinion that ‘work’ makes us product oriented whereas ‘play’ frees us from such constraints and allows us to try out new behaviours, exaggerate, modify, or abbreviate sequence of behaviours leading to the development of higher order thinking skills. (Whitebread, 2012, p.64) In short, all work and no play makes Jack a dull boy! In fact, there is increasing consensus among researchers that ‘play’ should not be opposed to ‘work’, where the former is allowed when the latter is completed. Nor should play be something that is done by children on their own and work be something that is done with an adult. Certainly, play needs to be self-initiated by children and participated in out of free will, for the sake of enjoyment. Yet, there is much that adults can do to enhance the quality of children’s play, leading to both developmental as well as educational benefits. Following are some suggestions. A facilitative environment is not just an environment with diverse play materials and opportunities, but also one in which children feel secure. For children to go ahead and try out new behaviours, they need to be in a safe context with no adverse consequences. The next way in which adults can support the play of children is by providing a range of opportunities. Since different types of play benefit children in different ways, it is a good idea to let children benefit from experiencing a good mix of outdoor/indoor, solitary/group, vigorous/quiet, concrete/symbolic play. Having options to choose from also caters to the diverse temperament of children. Some children may, for instance, choose to play in solitude while some will spontaneously gravitate towards others. This requires collection of a range of developmentally appropriate materials. This means that in order to outfit your home or classroom with the right kind of toys and games and activities, you need to understand the developmental needs of the children who will be playing these. For instance, sensory toys such as hanging mobiles, pull along toys, play dough are best for toddlers because they are at a stage where they are establishing their sensorimotor skills. Be sure that play materials and activities vary in the degree of social interaction they require, as well as the extent to which they could inhibit a shy child. Many practitioners believe in the golden rule – ‘simple is best’. Basic dressing up materials such as old sheets, sarees, shirts, gowns, caps, etc., can be easily explored and used in creative ways by children at play. It should also be borne in mind that materials that are too specific such as a bridal dupatta, for example, may be too suggestive, thereby, restricting the number of ways in which the child can engage with the prop. Children play differently in different spaces. Smaller spaces seem to suggest less running around and constructive play activities whereas large spaces suggest large muscle activities such as running, jumping, etc. However, it should be borne in mind that children may perceive spaces as being small or large depending upon their own socio-cultural backgrounds. It is possible for someone to experience overcrowding and loss of privacy in the same space where others seem comfortable. Similarly, another child may feel at a loss in a space where others don’t. Research indicates that children are more likely to engage in imaginative play in smaller spaces with flexible boundaries. Arranging the play space as per the nature of the group can help teachers maintain a degree of organization over both materials and time. In any group of children, there may be differences in the ease with which they engage in playing. Sometimes, a different social or cultural background may cause children to be reticent. In this case it is useful to provide play materials such as blocks that support parallel play, i.e., playing together without extensive interaction. This will help children to slowly ease into the group. Children may also differ in their ability to engage in pretend play. Without being overly intrusive, an adult can make suggestions about themes if the children seem to be running out of ideas or even provide a plotline or a story around which pretend play can revolve. Yet another way in which adults can support the play of children is by participating in it. This is very different from the usual supervisory roles in which adults usually locate themselves in the play of children. For an adult to participate, it is important for the adult to remember that in order to support the self-regulation efforts of the children, it is essential that the control be retained by the children. Adults can take on make believe roles such as ‘patient’ at a ‘doctor’s’ clinic or engage in hands-on play such as building or puzzles. This can greatly enhance the quality of the play as well as the language it supports. Research indicates that ‘guided play’ (play that involves a planned play environment, enriched with objects and toys that provide experiential learning opportunities, and a teacher who co-plays with the children, asking open-ended questions and suggesting ways of exploring that children may not have thought of) can greatly enhance the quality of play. 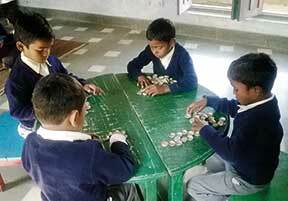 Many aspects of learning of concepts, such as that of shapes, can be enhanced by such adult participation. Finally, whether the adult-supported play is play for the child or not, has crucial implications. It must be borne in mind that if the activity is not fun and not engaged in out of free will, it will no longer remain play and become yet another adult-guided activity. A series of studies by Howard et al. (2010) brought to light some interesting evidence. The study showed that children may perceive a situation as being ‘play’ or ‘not play’ quite differently from adults. Children perceived situations as play or not play depending upon the amount of choice that was offered to them, their enjoyment, where they were located (such as on the table or the floor) and even on the basis of whether books were involved. Adults who understand the importance of play in development and support children’s play with their creative planning and enthusiastic participation can make play an even more meaningful engagement than it already is. Understanding and supporting play not only helps adults to relate better with children and lead them to better developmental outcomes, it also serves another important function — that of keeping the child alive in grown-ups. Howard, J. (2010). Making the most of play in the early years: The importance of children’s perceptions. In P. Broadhead, J. Howard and E. Wood (eds), Play and learning in the early years (pp. 145-160). London: SAGE Publications. Hughes, F. (2010). Children, play and development, fourth edition. Thousand Oaks, CA: SAGE Publications. IGNOU (Indira Gandhi National Open University). (2008). Importance of play in development. In DECE-1: Organizing child care services, Block 1, Unit 5. New Delhi: IGNOU. Pellergrini, A. D. (2009). The role of play in development. Oxford: Oxford University Press. Faulkner, D. (1995). Play, self and the social world. In P. Barnes (Ed. ), Personal, social and emotional development of children (pp. 231-286). Milton Keynes & Oxford: The Open University & Blackwell Publishers. Kincheloe, J. L. & Horn, Jr, R. J. (Eds.) (2007). The Praeger handbook of education and psychology. Westport, CT: Praeger Publishers. Whitebread, D. (2012). Developmental psychology & early childhood education. London: SAGE Publications. The author is Assistant Professor in the Department of Elementary Education, Lady Shri Ram College for Women, University of Delhi. She teaches courses on Child Development and Human Relations in Education. She can be reached at itsmepriyanka@gmail.com.